Cornish folklore and legend – Under the influence! Cornwall in the British Isles is rich in traditional folklore, legends and mythology greatly influenced by its historic and cultural connections. Celtic, Saxon, Viking, Christian and many other influences are interwoven to create marvelous legends and stories. This page serves as a brief introduction to the rich world of Cornish folklore and legend. Other pages on this site will look into the legends and folklore more closely offering interpretations and insights. Giants play an important part in Cornish folklore. There are many Cornish landmarks that are said to have been created by giants or associated with them. These may be found all over Cornwall from the barren granite rocks and wild rugged landscape of Bodmin Moor, to the dramatic windswept cliffs and coves around the coastline. The tiny island of St Michael’s Mount was said to have been built by a giant named Cormoran and in some versions of the tale with the help of his wife. Cormoran used to stride across the narrow sea channel separating the island from the mainland and raid the local farmer’s sheep and cattle. 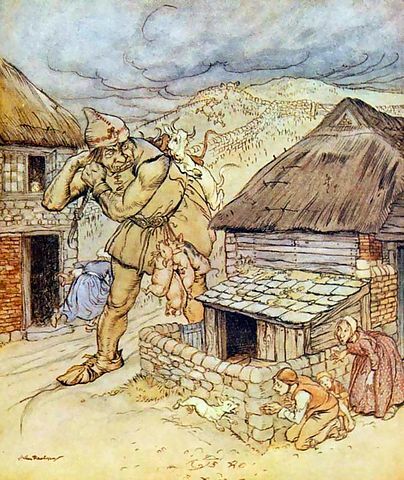 He was said to be the first victim of Jack the Giant Killer who was the son of a local farmer. Jack lured Cormoran into a hole he dug which brought him down to Jack’s level enabling him to kill him.